The market heard a dovish Bank of England today and sent sterling down by around than one percent. Initially sterling had reached its highest level since the US election; extending its recent rally a little through $1.27, but has now reversed lower. A close below yesterday's low ($1.2540) would be a potential key reversal. We had identified several technical signals that had suggested potential toward $1.28. Trend line and technical support are found between $1.2490 and $1.2525. A break could signal a move toward $1.2400-$1.2430 initially, and maybe $1.2260, if/when the US dollar rally resumes. It is difficult to identify the dovish impulse. It is possible the many participants had expected a more hawkish message, Yet it revised up growth, warned that inflation would likely overshoot its 2% target on a two -year outlook. It completed its Gilt purchases but have a few billion more of corporate bonds to buy to reach its GBP10 bln target, but is running well ahead of schedule. The growth forecast for this year was lifted substantially: from 1.4% to 2%. Growth is expected to slow to 1.6% in 2018 and 1.7% in 2019. Inflation is expected to be 2.6% in two -year and peak near 2.8% in H1 18. The dovish tint to the growth forecast that has implications for inflation expectations comes from the BOE discovering spare capacity in the UK economy. The slack is in the labor market. Unemployment, the Bank of England now says, can fall to 4.5%. Previously 5% was thought to be full employment. For policymakers, this means that the economy growth may not be inflationary. In turn, that means that the projected increase in inflation may not be so worrisome and more transitory, having to do with sterling's past slide and the recovery in oil prices. Later this year, large parts of the fall in sterling and the increase in oil prices will drop out of the comparisons (base effect). Previously the Bank of England expected Brexit to take 2.5% off the size of the UK economy. Now its says 1.5%. Carney defended the earlier and aggressive response to the referendum. Some argue that the resilience of the UK economy means that stimulus was not needed. 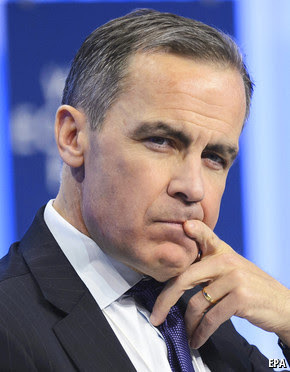 Carney thinks that the steps the BOE took helped undergird consumer and business confidence and helped buoy the economy. Carney also reiterated that the central bank is inclined to tolerate an overshoot of inflation. He also balanced this by repeating the caveat: its tolerance is limited. These comments did not break fresh ground, and it would seem a stretch to link these with sterling's sell-off. Inflation expectation by the five and 10-year breakevens eased about four basis points today to 3.26% and 3.41% respectively. The conventional Gilt yields fell six-seven basis points. Liquidity considerations may help account for the decline in the breakevens, which remain at elevated levels. The 10-year breakeven has risen 40 bp since the end of last year. The five-year breakeven is up 20 bp. Another issue that investors will want to monitor closer going forward is consumer spending. The Bank of England noted that it was being fueled by new borrowings and a draw down in savings. This may be worrisome because the full extent of the squeeze on real earnings has not been felt. It may still be as much as a year away unless wage growth accelerates or inflation slows. Neither seems particularly likely. Also, with short-term mortgages, there is a relatively quick pass through of higher market rates. In equities, the FTSE 100 was aided by the drop in sterling. It rose 0.4%. It is interesting that although most major markets fell, the FTSE 250 eked out a small gain (~0.1%). Most sectors were down, but information technology and materials blunted most of the resilience. Tomorrow the UK reports the service and composite PMI. Both are likely to have slipped a little, but after the BOE, the immediate data is unlikely to be market moving. Next week's highlight includes December trade figures (slightly smaller deficit is expected) and industrial output (a small decline is likely after the heady 1.2% gain in November). Data from the fourth quarter may interest economists, but it is unlikely to alter investors' views.